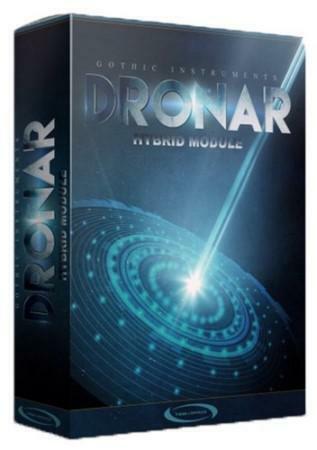 DRONAR Hybrid Module makes it astonishingly easy to create rich, dramatic, complex and evolving atmospheres with a set of controls designed to invite deep exploration, expression and discovery. Incredibly innovative and addictive, there is nothing quite like DRONAR for offering so much live expression control - it will change the way you create atmospheric sounds. - Below the surface, DRONAR is a vast modular multi-timbral synth/sampler with multiple independent arpeggiators. DRONAR is a deep, expressive and innovative atmospheric sound creator. This first module in the series - The Hybrid Module - creates deep, grainy cutting-edge, evolving cinematic and sci-fi atmospheres with 300 inspiring presets. Future modules will explore different areas of sound and music, and owners of the Hybrid Module will be able to purchase them for less. Uniquely, DRONAR creates complex atmospheres from a very small number of notes played (1 to 4 recommended). It spreads out the chord in the mid-range, adds a root bass note, a high note and then adds evolving sound effects. 8 simultaneous different sounds are then animated with LFOs and arpeggiators to bring them to life. The result is rich and dramatic. All this complexity from a few fingers on one hand frees up your other hand to expressively control the dials with mouse drags or external MIDI controller knobs, and record the changes as a performance in your DAW. Subtle dial movements give instant and deep expression, ideal for soundtracks as well as highly expressive cinematic pads in any genre. Because DRONAR instantly adds low, mid-range and high sounds plus sound effects, you barely need other sounds to quickly create a complete piece of atmospheric, expressive music. Needing to only play a few notes and move a few dials to get such rich expression is obviously inviting for beginners, but an expert will get much further by knowing what notes to play and how to express emotions using the dials. INTENSITY (also controlled by the Mod Wheel) takes you from silent to powerful by fading up through different velocity layers. MOVEMENT has a global effect on the intensity of the arpeggiators - set it high for strong effects and zero for a flat pad sound. HI, MID and LO control the automatically generated high notes, mid-range notes and bass notes. Moving these dials has a huge expressive effect on the music. It's only like using a mixing desk and yet - having it so accessible in front of you encourages you to work with the balance as part of the original creative expression, instead of a mix decision later on. FX controls the level of 20-second futuristic, unpitched sound effects loops in the mix and add instant movement and complexity. Then, beyond the shimmering immediacy of the �?Main Page' UI awaits a whole other world of expert control, turning DRONAR into a vast modular multi-timbral synth/sampler with multiple independent arpeggiators. It´s addictive! We recommend downloading the PDF manual on the right hand side of this page for an in-depth explanation of Dronar´s features and capabilities. DRONAR starts from hundreds of evolving, 20-second sample loops. 8 of these are loaded into each �?Drone' (an .nka preset file in the /Data folder, one loaded onto each �?Drone Key'), and then there are 12 Drones in each .nki patch (in the /Instruments folder). Gothic Instruments Dronar Hybrid Module KONTAKT MAC download links are externally hosted on Extabit, Rapidshare, Rapidgator, Netload, Uploaded and Gothic Instruments Dronar Hybrid Module KONTAKT MAC also available directly on Torrent Sources.